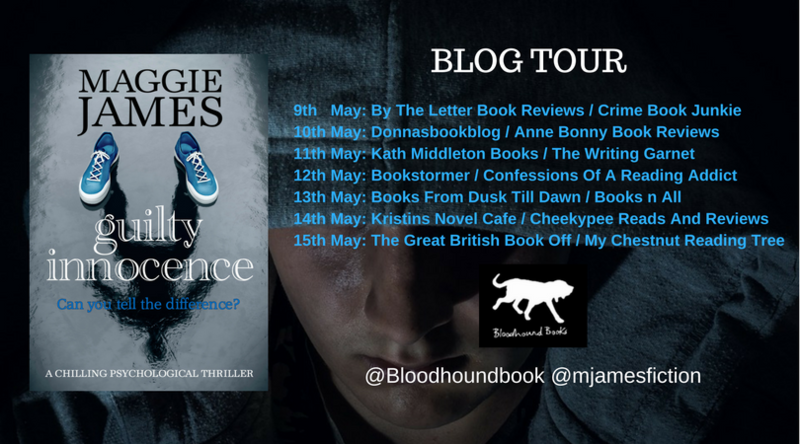 Firstly I wish to thank Sarah Hardy and Bloodhound Books for inviting me to take part on this Blog Tour for Guilty Innocence by Maggie James. Natalie Richards finds more than she bargained for when she snoops through her boyfriend’s possessions: evidence that Mark Slater was once convicted of a brutal killing. Heartbroken by what she’s discovered, Natalie’s dreams of a future with him collapse. Only the other person jointly sentenced for Abby Morgan’s murder, the twisted and violent Adam Campbell, knows the truth. That Mark played no part in Abby’s death. Meanwhile, circumstances have thrust Mark back in contact with Adam, who, aged twenty-five, is more domineering and chilling than ever. Can Mark rewrite history and confront his nemesis? This is the second time that I have read this book, the first time being when it was originally published in 2013 and boy oh boy it was just as jaw dropping this time round as it was then. I really believe that this is Maggie James’s best work of all the books that she has written and I have read them all. There is a saying that it is not all over until the fat lady sings well in this story it would be on the last line of the book because there is no working this one out, no second guessing, just the ultimate wowser of wows! Just fabulous. 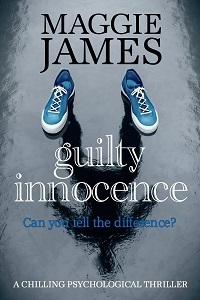 Do be warned though this book is about child murder carried out by children so in places not the easiest read, but the story really is something else. It is cracking. How the heck do you decide the length of time a child that has committed murder serves for the crime, Life? Well if that child commits murder at 11 should he/she serve 11 years because that has been their life time so far? Well the two boys that brutally murdered 2 year old Abby Morgan were back in society all grown up, with new identities and completely unrecognisable. Fourteen years had gone and Mark Slater had already broken a rule. If he saw a girl more than a couple of times he must tell his parole officer but he was sleeping with Natalie Richards and he really liked her and she him. The only thing was she wanted some sort of commitment and Mark couldn’t tell her why he couldn’t give her that. Natalie was determined to find out if he had another girl but what she found was a monster. OMG what the hell would you do? Oh this is so darn good. This is what I loved about this book. There weren’t clear options because emotions were just too high and Mark seemed so sincere that I couldn’t help but want to give him a second chance. I found myself talking to this book more than once, trying to give advice to characters that already had their fates set in type and couldn’t hear my ‘What the hell are you doing’ and ‘You have to be kidding’ remarks. I was just so involved. The story leaves present day and travels back in time to the day the innocent little girl was taken and brutally murdered and your heart really breaks. The scenes here are quite horrific and there are other violent scenes too but it is all part of the story. There are so many casualties in this story that deal with the aftermath in their own way, because it does affect everyone involved. This is a pretty pacey book, very tense and very descriptive. The plot is outstanding, highly recommended for suspense, action and thrilling entertainment. Pure Magic Maggie James!